Collective Blog: What leads to behavioural change amongst rural women? What leads to behavioural change amongst rural women? 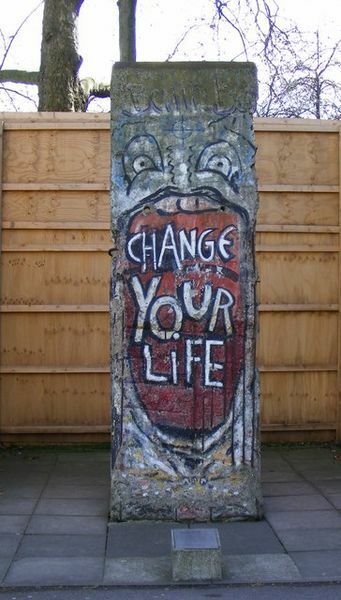 Change isn't always as easy as is implied by this graffiti. Behavioural change theorists argue that individual or community behaviour is embedded in complex cultural norms. Therefore, changes cannot occur in a straightforward manner. In Pakistan, women-centric social transfer programmes challenge cultural norms and have often helped lead the way to behaviour change. I still remember how our male field researchers would ask us not to include names of women in our surveys because the male household members would not want to share the names of their wives, sisters and daughters. It was common for rural women to not have registered National Identity Cards (NICs). However, programmes such as the Benazir Income Support Programme (BISP) (a social cash transfer programme for women living in extreme poverty in Pakistan, launched in 2008) have played a key role in changing these behaviours. BISP has led to an increased recognition of women’s contribution to household income and greater agency regarding their consumption decisions. Another behavioural change programme, the Prime Minister’s Programme for Family Planning and Primary Health Care, which was launched in 1994 to deploy 100,000 ‘Lady Health Workers’(LHWs) throughout the country, allowed women more agency in family planning. Both these programmes have had a significant positive impact on patriarchal norms and behaviours. Many claim that another way to achieve behaviour change and women’s empowerment in Pakistan is through the use of mobile technology. A number of programmes such as mHealth, mNutrition, and mAgriculture are using mobile phones for advocacy, counselling, and Behaviour Change Communication (BCC). In Pakistan, mobile phone usage is on the rise. In 2015, 81 percent of men and 64 percent of women were using mobile phones. However, these users are more likely to be urban than rural. In rural areas where patriarchal norms dominate, these users are most commonly men. According to my recent experiences for a LANSA study in rural Sindh, cell phones in rural areas are most often not owned by a single person, but are seen as the extended family’s joint property. Women are not allowed to own their own phones, or even to use a phone without adequate reason and a man’s permission. Last year I was in an ethnic Baroach village in the upper part of Sindh province, where I was talking with a young man in the Autaaq (the men’s meeting place in the village). He mentioned that he was engaged to a woman who was a public sector employee, lived in a town, was more educated than him, and used a cell phone. “Her family is ‘forward’ and they don’t follow Baroachi customs. Our family has put a condition that she will not bring her phone here. We are not urban people and I am proud to follow our customary norms”. This conversation led me to think that in order for mobile-based BCC interventions to work for nutrition in Pakistan, we would first require interventions that change patriarchal norms around mobile phone usage. One such programme is the Nutrition Initiative, which is a global mobile nutrition programme started in 2013. It aims to improve the nutritional state of mothers and children in 10 low-income Sub-Saharan African countries. It is still in early stages, and we should perhaps wait for this programme’s evaluation before it is adopted in Pakistan, but it is an innovative approach worth looking at. Until then, supporting women-centric social transfer programmes that challenge embedded cultural norms seems to be the most effective way to achieve effective behavioural change amongst rural women.